On a planet inhabited by a giant, blue, humanoid race known as Draags, they have a rodent problem. And the rodents are us. Sometimes, a kind-hearted Draag child will claim a human — known as Oms — as a pet, like we would hamster. Not like a dog, a companion, but like a tiny, living toy whose novelty can't really last that long. But by and large, Oms are treated as a nuisance and are regularly purged from the fields outside the city to keep the population of wild Oms down. The main Draag that Fantastic Planet follows is a child named Tiwa, and her pet Om is Terr. As Draags age, they begin their instruction, which is telepathic in nature, and all Draag knowledge is conveyed using a special headset. Terr ages much more rapidly than Tiwa, and eventually finds a way to steal her headset, escape, and bring knowledge to a group of wild Oms living outside of town in desperate need of something that will allow them to survive the coming purges. 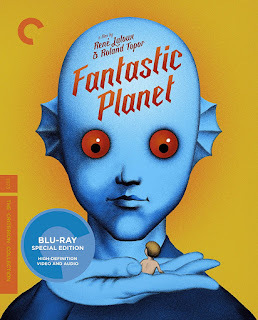 So you wouldn't say that Fantastic Planet is particularly light fare, despite the large-eyed, actually-kind-of-cute character design of the Draags that adorns much of the promotional material for this 1973 animated film. In fact, the opening of the film is quite emotional, as we watch Draag children flick a human mother back and forth in play, until she finally stops moving. Like human children might thoughtlessly do to a bug. It's hard to know exactly what to write about this movie, because even forty-five years after its release, it remains essentially a totally unique experience. I had seen moments of it, and as a big fan of animation, I came to it specifically to see the animation. The story could have been nonsense, or just a psychedelic mish-mash of imagery, and it really wouldn't have mattered to me. Visually, this looked like it would be a stunning work, and it definitely delivered. But the depth and effectiveness of the narrative surprised me, and in fact continued to surprise me as the film unfolded. I was drawn to the stunning visuals, and would kind of get lost in them, but then find myself getting yanked back into the story afresh, and thinking, "Wow, this really is good!" Over the years, there have been debates about the allegorical meaning of the film — whether we are to understand it as a plea for better relations among peoples, or perhaps a message about the importance of animal rights and welfare. I'm not sure it matters very much. 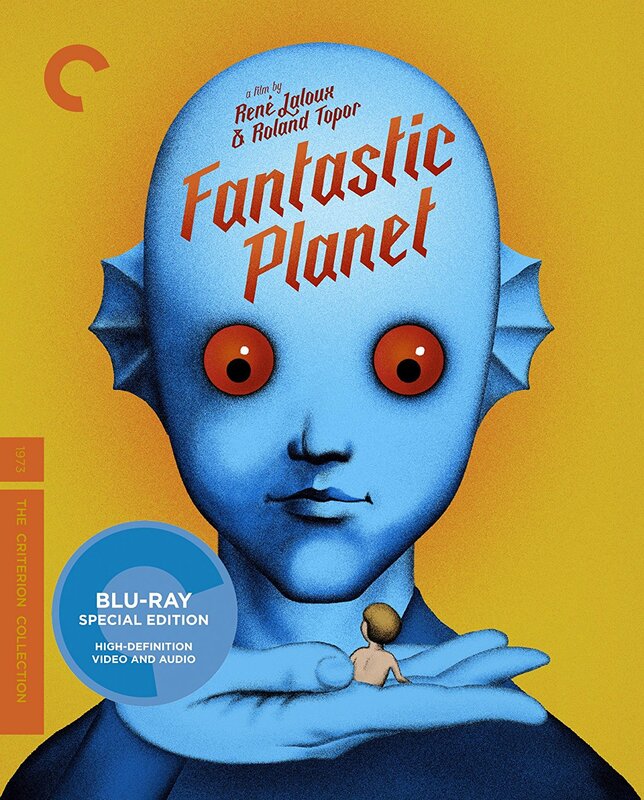 What I took away from Fantastic Planet was an invitation to greater awareness, of both the self and of others, and to the importance of compassion. If we can obtain it, we may exercise that compassion on behalf of others, or on behalf of animals, or on behalf of the planet, I suppose, but the important thing is that we do exercise it. I think such a universal message helps this film to stand somewhat outside of time. While the music is waaaaay 1970s, and the years-long French-Czech co-production took place against the backdrop of Soviet tanks rolling into Prague, the film's message is timeless and the animation singular (visually not dissimilar to Terry Gilliam's Monty Python work, but deployed in a completely different manner), so I don't think you have to be a big animation nerd like me to find something touching and thought-provoking in this one-of-a-kind sci-fi film. Posted by Vance K — co-editor and cult film reviewer at nerds of a feather, flock together since 2012, sometime animator.